Super strong and colourful begonias for baskets. Massive 6 blooms from July to late autumn. Flowers trail beautifully in a waterfall of colour! Dazzling array of spectacular colours. Perfect for cut flower displays! 360 globes of colour cascading down from your hanging baskets and pots. Supplied as 10 extra large corms (5cm+ diameter) for bigger, better displays. Ready to plant. 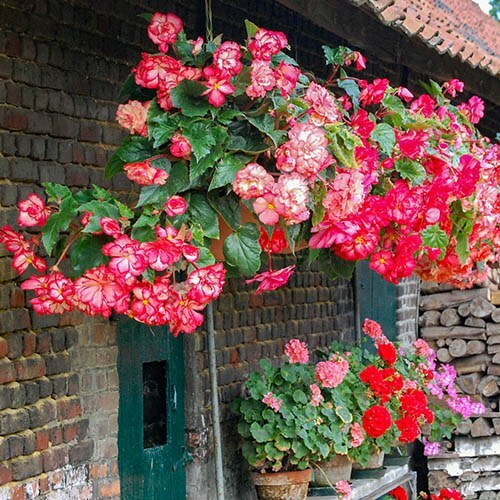 Brighten your summer hanging baskets and patio displays with these fantastic Trailing Giant Begonias. These exclusive Giant Belgian Begonias are highly sought after because of their incredible 6 inch (15cm) diameter Giant blooms and dazzling variety of colours. Thanks to all the weather we had last year, this years tubers are much larger than those normally available, which means they will produce an even bigger and more impressive display. You Garden have been lucky enough to obtain a limited number of these jumbo tubers so dont miss this one-off opportunity to obtain some for yourself and at a very special price too! Supplied as Jumbo Tubers (5cm+ diameter) for bigger flowers. we suggest starting them off in a frost free place on a windowsill, conservatory or greenhouse. Plant shallowly with the saucer-shaped part upwards. They can be slow to shoot in the cool, so do not worry if nothing happens for a few weeks.